Pay-per-click advertising (PPC) can help you earn valuable real estate in search results for keywords that mean the most to your business. One of the best things about this strategy is that it takes no time at all to see the effects of your campaign — as soon as you win an ad for a specific keyword, you’ll see a spike in your site traffic. However, if you want to outrank competitors and make searchers want to click your ads, you need to optimize your PPC ads. On this page, we’ll talk about what’s involved in PPC optimization and five strategies you can use to boost conversions for your most valuable ads. Keep reading if you’re ready to get started! What does PPC optimization entail? Optimizing your PPC ads isn’t as intimidating as it might sound. PPC optimization is simply the practice of improving different elements of your ads so that they win real estate and earn more clicks. There’s a lot of things that go into an ad campaign, so there are also a lot of elements to optimize. Your ad is essentially useless if it’s not perfectly augmented for search, which is why optimization is so important to any PPC campaign strategy. The ads themselves – the text, photos, design, colors, etc. These three areas are the most important to PPC optimization. Read on to learn how they’re involved in the optimization process! After optimizing the elements on our checklist, your PPC ads will be set for success! Before launching a PPC campaign, you’ll want to research the most beneficial keywords for your business. When we say, “most beneficial,” we’re referring to the keywords that’ll bring the most clicks to your ads. Start with a good old-fashioned brainstorm. First, select generic, general keywords related to your basic products and services. These keywords on their own likely won’t be the best to target since their competition is so high. 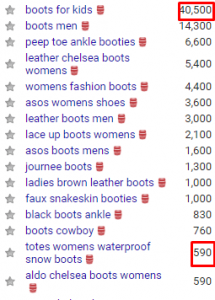 For instance, “women’s cowboy boots,” a general term, gets a much higher search volume than “totes women’s waterproof snow boots,” an extremely specific search term. This outlines in part why keyword research is so essential — identifying general keywords is important, but it’s crucial to come up with long-tail keywords as well. During your brainstorming session, try combining your general terms with adjectives relating to your product offerings. This will help you create your list of keywords to target. The next step involves plugging your keywords into a tool like searchvolume.io to gain insight into search volume and competition. The best keywords will have a high search volume and low competition. This step will help you choose keywords that are the most valuable to your campaign. Just like it’s essential to target the right keywords, it’s also a critical part of PPC optimization that you decide what not to target. When you use negative keywords, you essentially exclude specific keywords from your campaign that might seem like they fit your product offerings, but they don’t. For example, if you’re a hardware store that sells home interior paint, one of your negative keywords might be “vehicle paint” or “outdoor paint.” This ensures that people searching for those terms don’t land on your site. One of the things that makes PPC so successful is the fact that you can decide exactly who your ads are served to, based on demographics. In the past few years, Google Ads has made their targeting options even more granular and now offers more targeting options than ever. Take a look at just a few of the ways you can target your most qualified audience! Age: This is great if you sell products that are for a certain age group. Income level: If your company prides itself on the low cost of your products, you could target a lower income level. On the other hand, if you offer high-class products, you have the option to target a higher income level. Geographic location: One of the most popular and effective ways to target your audience is by geographic location. You can serve them ads based on their country, state, city, or specific boundaries that you create. Relationship status: Google gives you the option to target singles, married couples, or people in relationships. Education level: Whether you want to target customers with a high school diploma, those in college, or those going for their master’s degrees, Google Ads has options for you! Choosing who you want to target with your keywords is a vital decision and can determine the level of campaign success. Your ad copy can make or break a click, so it’s vital to your PPC optimization process that you test and analyze your copy. In order to test your ad copy, you’ll want to set up an A/B test. This kind of test allows you to assess two ads with varying copy to determine which one receives the most clicks. Keep in mind that ad copy isn’t the only thing you can test with A/B ads — you can also test the colors, the landing pages, and the calls-to-action. When you set up an A/B test for your PPC ads, Google will serve your two ads at random to different users. At the end of the testing period, you’ll have a good idea of what ad got more clicks, and therefore, which ad you should use moving forward. A landing page is where users end up when they click on your ad, and it is essentially the deciding factor in whether or not a user makes a purchase. Of course, users can navigate away from your landing page if they got distracted or if they’re waiting for next payday, but your landing page as a whole should convince them that they want to purchase your product. Nothing is more of a turnoff than a landing page that isn’t at all related to the ad that a user clicked. When a user clicks an ad, they’re interested in that product, which means your landing page should be all about, you guessed it, that very product! Associating cost with a product is a big deciding factor when a user is on the fence. You’ll want to be sure that the price is loud and proud on your landing page so that a user can decide if the product fits their budget. You should think of your landing page as the final step in a buyer’s journey — the last chance you have to wow them with your product. To do so, you should include a detailed description that features product dimensions, materials used, care instructions, available colors, and available sizes. Including this information gives users everything they need to make an educated decision on whether or not they want to go through with a purchase. Shortage of this information could cause them to second guess your product because they don’t know if you carry the color they want or the size they need. Perhaps the most critical part of a landing page is the call-to-action. This could be a button that says, “add to cart,” “buy now,” “learn more,” or “call now.” It depends on the product or service that you’re selling and what the next step is in the buyer’s journey. If you’re interested in making your own checks in the boxes of our PPC optimization checklist but aren’t sure where to start, WebFX can help! We’ve been in the business for over a decade and have driven incredible results for our clients in a variety of industries. For our client York Saw and Knife, we were able to decrease their cost-per-conversion by 20 percent and increase their year-over-year ads conversions by 108 percent. We know how important it is that your PPC ads are perfect, which is why we offer PPC optimization services to create the ideal ad for your most qualified audience. If you’re ready to optimize your PPC ads to drive real results for your company, feel free to contact us online or give us a call at 888-601-5359!